The race announcer counted down the seconds until the start as the runners beside me slowly moved closer to the line at the Glass City Half Marathon in Toledo, Ohio. Every runner comes to a race with a story and a goal in mind. My mindset before this week was filled with cloudiness and uncertainty as my training regimen was battle tested. My weekly 3 hour flights from Chicago O’Hare airport to Fort Myers, Florida for the past few months were starting to wear me down along with the weather extremes of the winter blues at home and the 87 degree heat down south. I was left wondering all the way to the start line if this crazy goal of a 7:55 minute average pace for the half marathon was truly possible. The race was crowded but jovial with anticipation as Mark and I met each other at the start line. Mark Davidhizar was running this race as a training run the week before his marathon so he offered to pace it with me. As we waited in our corral, Mark was chatting with a fellow Bib Rave friend until before we knew it, the 13.1 mile journey began. 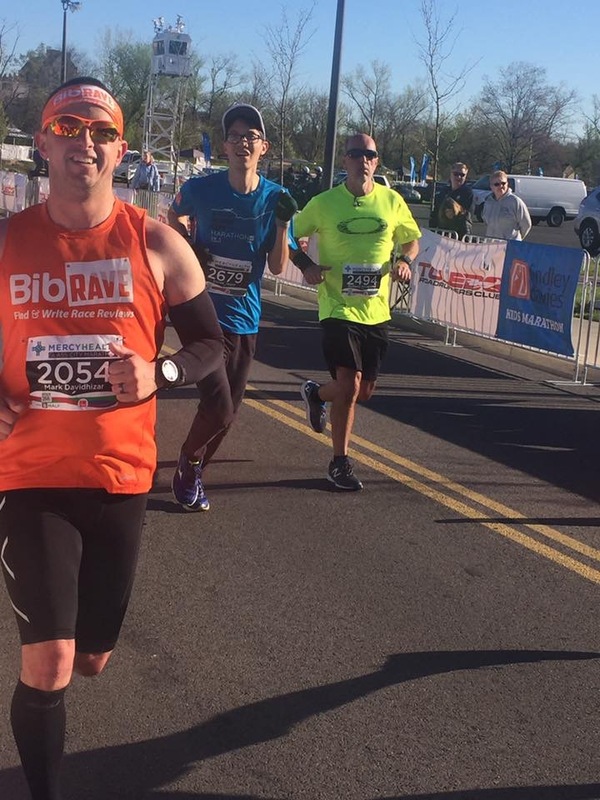 The first mile was slow and crowded as the runners took off, which was nothing new to me from my half marathon experiences but for Mark who is typically in the front corral, the slow movement presented a much different racing experience. I had prepped with my coach, Jake Gillette, and Mark in the week leading up to the race that one goal for this race was to start off slower than normal to save energy. We accomplished that goal with the first mile being an “8:09” minute pace. This race was a great opportunity to learn from a seasoned marathoner on how to run a race. The first tip was to “respect the distance and ease up the pace” early on in a half marathon. The excitement during the race and the week long taper leaves you feeling invincible. Not much further than Mile 1, Mark started to put on the brakes as we were marching forward to a speedy 7:24 min pace. We were able to slow the pace down and conquer the second mile at a “7:42” minute pace. I relied on Mark’s pacing and strategy throughout this race intead of the “live and die” dependence on my Garmin watch’s ouput values every mile. The second tip Mark taught me was to “run the hills at the same even pace.” Looking up at the first mini hill of the race, Mark reminded me that hills will cause you to slow down and that seconds can be gained on the downhill portions. It’s not worth wasting the energy to sprint up a tough incline. The third mile was a “7:45” minute pace. Water stations are a tricky beast and it really depends on your training how you should approach hydration in a race. Mark’s third tip was to “take a few sips of water at every water stop in a race.” I mimicked my actions based on Mark’s strategy and quickly learned that a sip is manageable at a run pace through a water stop, instead of big gulps of water. In the weeks leading up to this race while training in Florida, I drank a lot of water throughout the day to stay hydrated so that I was top notch for my half marathon. Miles 4-6 were going smoothly at “7:43, 7:51, and 7:44” mile markers. I saw Ashley on the course cheering us on with her race sign and cowbell at mile 6. This was a checkup mile to see how the legs were feeling and if my breathing was under control. I passed the test and was feeling fantastic at this point so I passed on the Honey Stinger waffle. Mark gradually increased the pace and we passed the 1:45:00 half marathon pace group. I had flashbacks in the second half of my race to previous PR attempts of being out of breath and tired in the legs. Mark’s polished guidance kept me steady by reminding me that racing is a different feeling than the training runs. I have completed multiple 7:30 min pace workouts in interval training but did not fully understand this advice until after the race. Miles 7-9 were maintained consistency at “7:34, 7:42, and 7:39” mile markers. It became an all-out effort for me to run hard the rest of the race. My fourth race tip was to “trust your friend the pacer” as he started to drop the hammer on the downhill portions of the race. We picked up the pace, passing individuals along the way as Mark jokingly offended my Spartan hat to push me forward. My Spartan pride kept on going as we wrapped up mile 10 at “7:29” min and mile 11 at “7:26” min where Ashley cheered me on to finish strong. The finale of my Glass City race was just before mile 12. Mark started to run in front of me to edge me on to the finish line. I was running at full max effort and with heavy legs and difficult breathing. In other races, I would take a walking break at this point but I was determined to keep up with Mark. I remember telling Mark that I was starting to fall apart and my wheels were coming off. Mark chuckled and reminded me that we only had one more mile to go with the stadium in sight. We rounded the corner and headed home to the Toledo Rockets’ football stadium finishing at the 50 yard line. I saw the clock tick away with a finish at 1:41:26 (average of 7:44 min pace) and was happy with my time but was also completely drained of energy. I did not have to visit the medical tent but had to sit down for a couple of minutes as my heart rate lowered. I was thankful to complete my 5th half marathon successfully without any injuries. The realization of my personal record didn’t truly hit me until looking through pictures and Facebook comments from friends on the ride back to Indiana. I not only ran a PR but beat my last record by over 2 minutes. I would like to thank my wife Ashley Jager, Coach Jake, Mark and Tina, and many other running friends for this early season success. Mark was a great pacer and friend for helping me to achieve my goal and I hope he enjoyed running in the middle of the pack with me on this race. It was a rare occasion for me to have a friend who typically runs sub 7 minute miles to be a great ambassador of Bib Rave by reaching out to run this race together. I loved this race experience and will cherish this race as one of my top 3 half marathons ever. I plan to take off next week for work but will see local runners at the Wakarusa Maple Syrup 5K this Saturday April 29th. Nice read and a nice start to the season. I also enjoyed reading about the Aladdin show and the mini golf course looked cool.